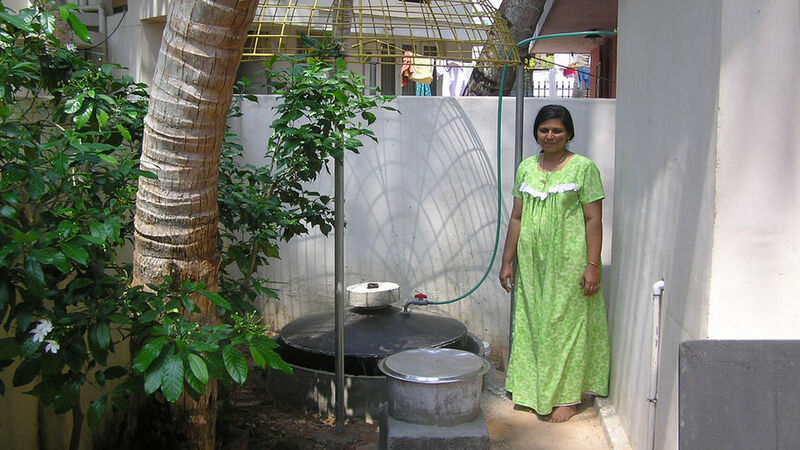 Mrs Gayashree with her BIOTECH biogas plant and umbrella to protect it from falling coconuts. Getting rid of waste, both food and human, is essential to hygiene. But waste is also a cost-effective and sustainable source of fuel. 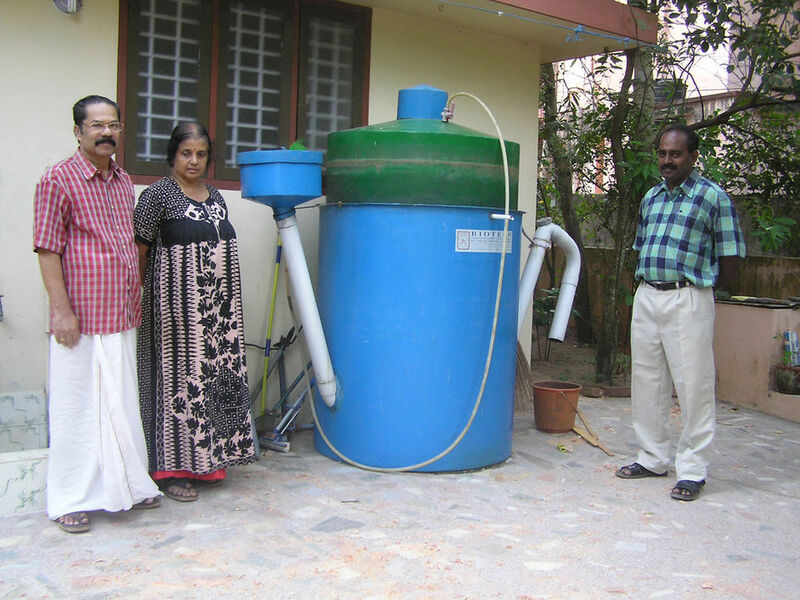 Since 2004, BIOTECH has improved the lives of hundreds of thousands of people in Kerala, Southern India and saved several thousand tonnes per year of CO2 simply by getting rid of waste. By 2009, 16,000 biogas plants installed. Biogas displaces about 50% of LPG use. Plants save about 3,700 tonnes/year of CO2. Before I had the plant, I had to walk for half an hour to put my waste in the corporation bin. Before, one bottle of LPG lasted 40 days, now it lasts 70. Kerala is a prosperous state in South India, with a growing middle-class population. Many family members spend part of their working lives overseas. Kerala also has a thriving tourist industry with numerous beach resorts. Leaving out waste food for animals, which works relatively well in rural areas, is simply not acceptable in this suburban environment, and there is a demand for the clean and hygienic disposal of waste for homes, institutions and municipalities. Many local panchayats (councils) operate door to door waste collection services, but animals tear open rubbish sacks to get to food waste, and create more litter. 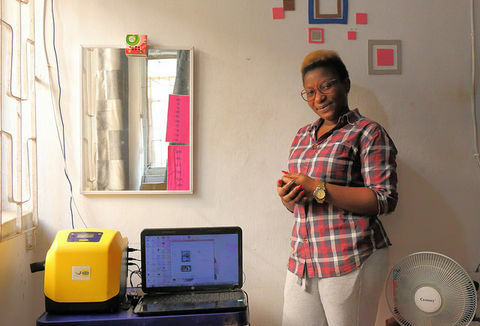 The biogas digesters developed by BIOTECH manage organic waste and wastewater at source, and produce significant amounts of clean gas for cooking and other purposes. 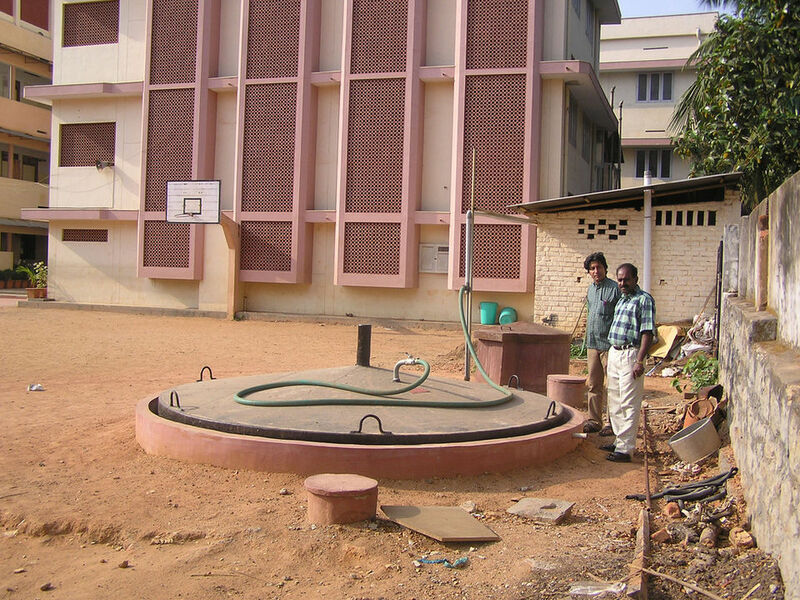 Biogas plant supplied by BIOTECH at Panavila Muslim Working Women's Hostel, Trivandrum. BIOTECH was founded as a consultancy in 1994 by Mr A Saji Das, to research, develop and install renewable energy systems, in particular systems producing energy from waste. In addition to the biogas work, BIOTECH supplies improved smokeless ovens and stoves, solar lanterns and home lighting systems. BIOTECH has grown rapidly since its 2007 Ashden Award. 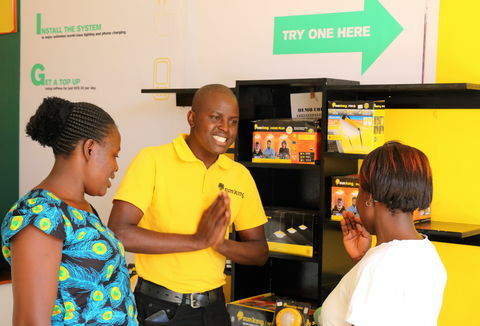 Turnover has increased from US$168,000 (Rs 7.2 million) in 2005/06 to US$565,000 (Rs 26 million) in 2008/09. Full time staff have increased from 42 to 140, and piece-work technicians and volunteers from 180 to 600. Biogas systems take organic material into an airtight vessel, where bacteria break down the material and release biogas – a mixture of mainly methane with some carbon dioxide. The biogas can be burned as a fuel and the solid residue can be used as organic compost. The biogas plants made and supplied by BIOTECH are designed to dispose of organic household and municipal waste and toilet waste. BIOTECH has developed standard plants in different sizes to serve three different market sectors: domestic (individual households), institutions (schools, hostels, hospitals, hotels) and municipal (local councils). The biogas plants made and supplied by BIOTECH are designed to dispose of organic household and municipal waste and toilet waste. A BIOTECH plant at a school in Trivandrum, South India. BIOTECH’s use of pre-fabricated components simplifies the construction of the plants. On-site construction takes only about four hours (instead of four days) and semi-skilled or unskilled masons can install the units easily. A domestic biogas plant costs about US$220 (Rs 9,500). The national Ministry of Nonconventional Energy Sources (MNES) offers a subsidy of US$60 (Rs 2,700) for each domestic plant up to 10 m3 capacity, and the local and district panchayats provide further subsidies - typically US$60 (Rs 2,700) in urban areas and US$80 (Rs 3,500) in rural areas. The purchasers pay the remainder directly. The MNES subsidy is paid to the beneficiary through BIOTECH after a government official has inspected the plant. A typical family normally uses about 168 kg of LPG a year. Biogas replaces about 50% of this use, or about 84 kg per year, saving the family about US$53 (Rs 2,280) per year. This means that the family can pay back their contribution to the cost of the plant in about three years, and more quickly if they collect extra food waste from shops to increase their biogas production. Biogas replaces about 50% of this use, or about 84 kg per year, saving the family about US$53 (Rs 2,280) per year. One of BIOTECH’s portable domestic plants. The integrated waste management plant cost US$71,000 (Rs 3,000,000), of which US$2790 (Rs 120,000) came from MNES and some from the local and district panchayats. BIOTECH provides some capital, and charges an annual operating fee to run the plant. BIOTECH manufactures all the plants in its own workshops to a high standard. The details of all plants are recorded so that BIOTECH is eligible for the subsidy from MNES. BIOTECH staff visit each new customer every three months for two years in order to ensure that the plant is running smoothly. The oldest plant in use is over ten years old (2007). There have been occasional minor problems with gas pipes blocked (or chewed through by rats), water condensing in pipes, and broken tap fittings but these have been fixed quickly by BIOTECH staff. I collect from the shop, I get some food waste or vegetable waste. I fill the drum and by morning I have half a drum of gas and it lasts for four hours. The total capacity installed by BIOTECH between 2004 and 2007 was 16,000 m3, split 81% for domestic users, 16% for institutional users, and 3% for energy-from-waste schemes. Nearly 12,000 domestic plants were installed (serving about 48,000 people), about 200 institutional plants and 19 energy-from-waste projects (with 12 further plants under construction in 2007). The total rate of biogas production from all installed plants in 2007 was estimated to be about 16,000 m3/day, which replaces the equivalent of about 1,400 tonnes/year of LPG and diesel. The plants therefore directly avoid the emission of about 3,700 tonnes/year of CO2, with further savings from the reduction in methane production from the uncontrolled decomposition of waste, and from the transport of LPG. For most domestic users, the main benefit of a BIOTECH plant is the easy, hygienic disposal of food waste and the savings made in LPG use. Operators of institutional plants are pleased with the absence of odour, which was unpleasant for both them and their neighbours. For the markets and councils, the removal of food waste and the associated public health risks is a great advantage. This is a very convenient way of disposing of waste without any headache. No smell, no mess, we are very very happy with it and we just hope that more people would go about installing this because it keeps the environment clean, and it gives us gas as well as fertiliser. Biogas replaces about 50% of LPG use in an average family. 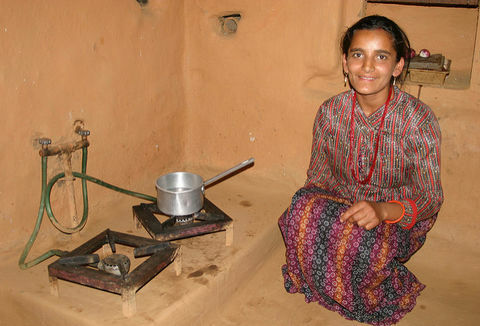 In homes and institutions, cooking is always started on the biogas stove. Typically, this can be used for two hours using the gas produced during the previous day, and the pot is simply moved to the LPG stove when the biogas runs out. Biogas replaces about 50% of LPG use in an average family. Institutional plants with latrines attached replace between 50 and 75% of their LPG use, because of the additional biogas production from the sewage waste. Biogas is safer than LPG for cooking, because it cannot be lit accidentally by a spark. The effluent or residue in the biogas plant makes good fertiliser which results in higher food production. The manufacture, installation and maintenance of the biogas plants has generated a significant amount of employment: this is estimated at 13 days for each domestic plant, 55 days for each institutional plant and 80 days for each waste to energy plant. Biogas digester tamks are pre-fabricated from ferrocement. BIOTECH plants are in demand. A pre-fabricated domestic plant can be installed within two to three days, provided that finance is available. The technology could be used in many other countries. 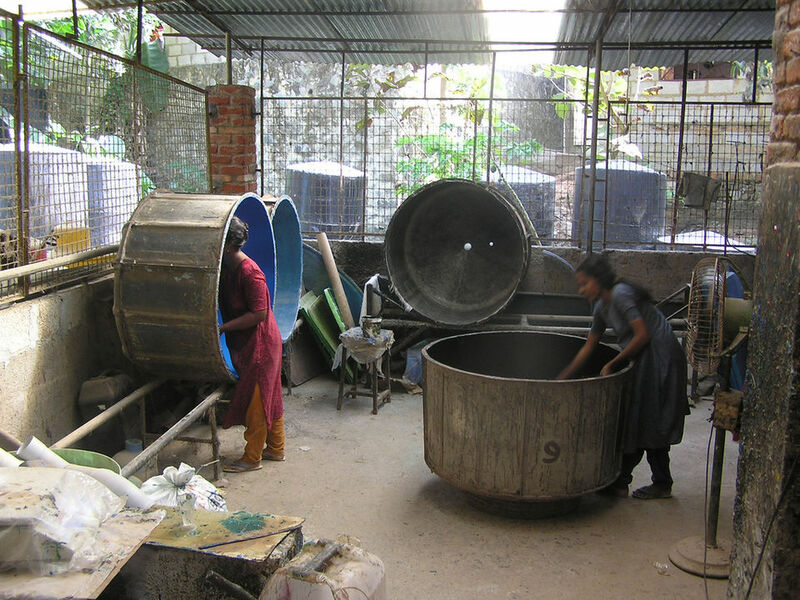 In rapidly growing urban areas, the safe disposal of organic waste at source is important for hygiene and cleanliness, and the value of the gas produced is significant for households and institutions. However, the greater potential is possibly at the municipal level, where there are serious public health risks from large volumes of organic waste, including pollution of water supplies. 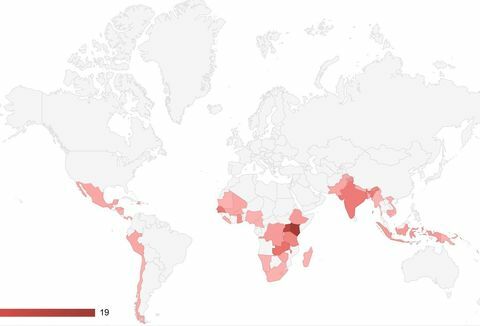 To work effectively the plants need an average ambient temperature above 30°C throughout the year – but it is in countries with these high temperatures that the health problems from unmanaged waste are the most serious. Since its 2007 Ashden Award, BIOTECH actively promoted its biogas plants. 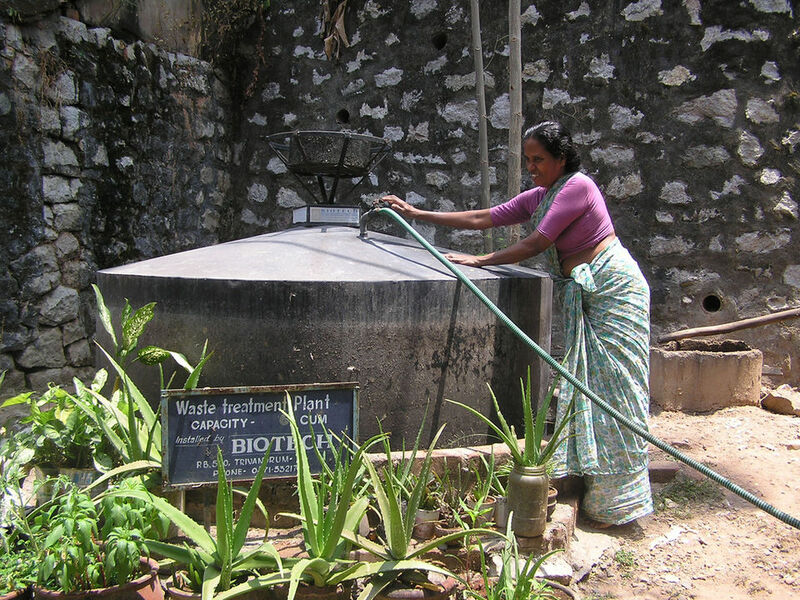 In 2008 it used part of the Ashden Award prize fund to organise a roadshow which travelled around southern India, demonstrating the benefits of biogas plants to a wide audience. Many people have come forward for installation of plants as a result of the publicity, and because of the rising cost of alternatives. BIOTECH has also invested time and money in improving technology. It has developed an engine for its energy-from-waste plants, which can run on 100% biogas rather than 80% biogas and 20% diesel; a dehumidifier for drying the biogas before it goes into the engine; and a system for heat recovery from larger plants. Recent innovations include a portable domestic plant made from fibreglass (100 installed); an anaerobic pre-digester for waste which decomposes very slowly (eight installed); and a modular biogas plant (four installed). Although the cost of domestic plants has increased from about US$220 (Rs 9,500) to US$350 (Rs 16,000), demand is still growing. By the end of 2009, a total of 15,700 domestic plants and 253 institutional plants had been installed. The major growth has been in municipal energy-from-waste plants, where 47 are now in operation compared with 19 at the time of the 2007 Award. In total, BIOTECH has provided 16,000 biogas plants, benefitting more than 200,000 people.